Facebook/ABC NewsWhite crosses built by Greg Zanis. This week, Greg Zanis drove 1,200 miles from his hometown in Illinois to Orlando, Florida. His mission? 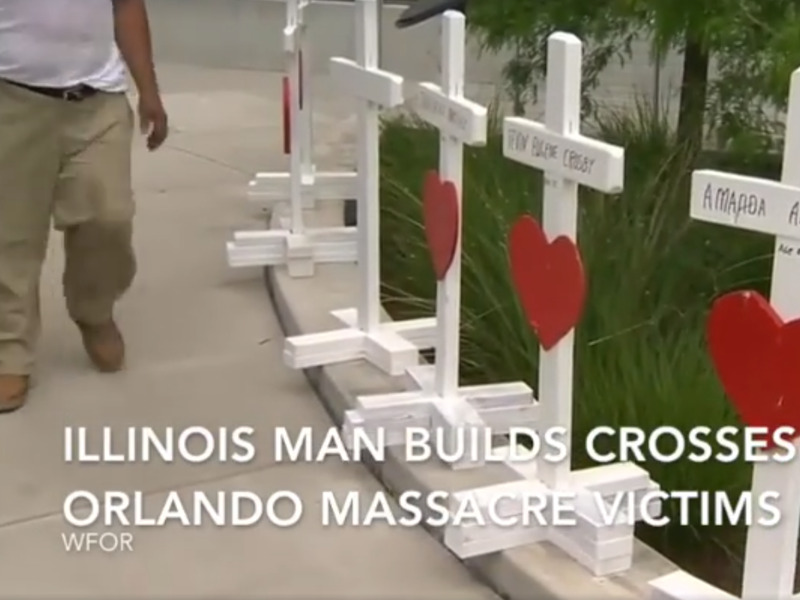 To set up 49 white crosses he had constructed in honour of the 49 men and women killed in Sunday’s tragic massacre at Pulse nightclub. Zanis placed the crosses outside the Orlando Health Regional Medical Center, where the dozens of wounded victims have been treated, ABC News reports. 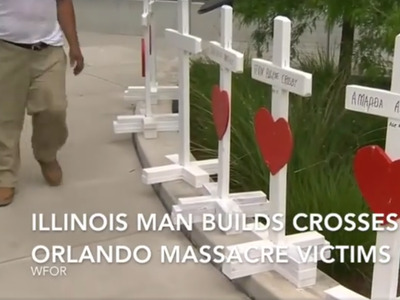 Greg Zanis built 49 wooden crosses then drove 1,200 miles from Illinois to Florida to place them outside the Orlando Health Medical Center. “My message today is love your brother, love your neighbour. Don’t judge ’em.”Zanis says he plans to pass along the messages people write on the crosses to the victims’ families. This isn’t the first time Zanis has travelled great distances to pay tribute to lives lost in mass shootings, CBS Miami reports. 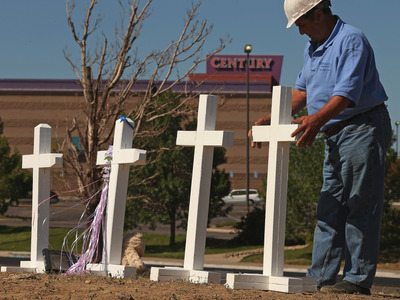 In 2012, he brought his crosses to Aurora, Colorado to commemorate the 12 who died in a movie theatre shooting. Later that year, he brought 26 more to Newtown, Connecticut, following the shooting at Sandy Hook Elementary School. 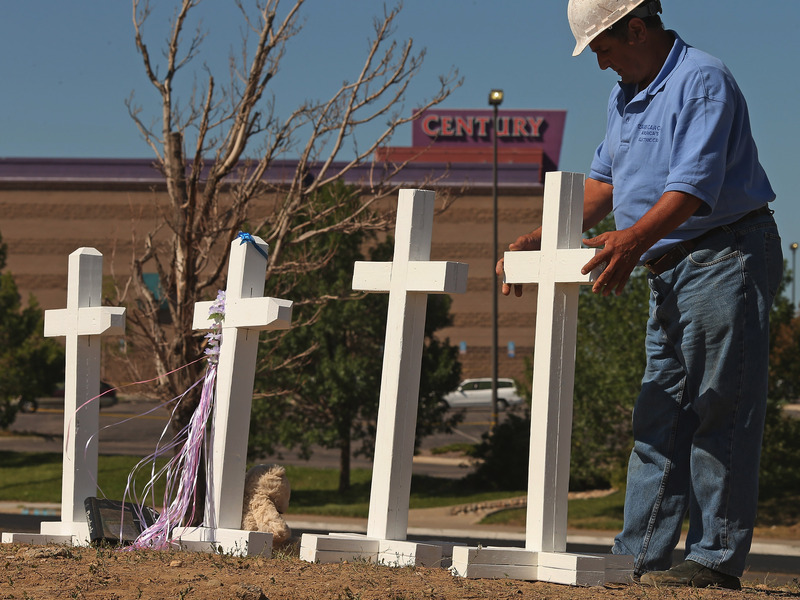 Getty Images/Chip SomodevillaZanis with some of the crosses he built after the July 2012 shooting at an Aurora, Colorado movie theatre. Zanis told CBS Miami that he began making the crosses after his father-in law was murdered 20 years ago. Now, he tries to deliver them to the site of every mass murder in the United States as a way to help mourners express their condolences.